Today's guest post comes to us from Temple University graduate, Michelle Zei. Michelle is a freelance journalist who recently visited the Aida Refugee Camp in Israel. Her experience gave her a unique perspective on the turmoil surrounding the Israeli/Palestinian conflict. “There's war on the streets and the war in the Middle East.” Tupac said it in the 90’s and it rings true today. But approaching any situation as an endless conflict has never helped in the past and to take it a step further seeing the ‘Israeli- Palestinian Conflict’ as continuously hopeless doesn’t garner interest from the American public. The conflict that is portrayed as ageless is, in fact a military occupation dating back to 1948. There are not two equal parties at war but rather an indigenous group pushed inside narrow, shrinking borders under Israel’s on-going military rule. The occupation of Palestinian land and people, like other forms of colonialism, consists of the destruction of communities and culture: crippled economies, displacement of people, separation of families, millions of refugees, and the arrest of young males without warrant. Additionally, the arrest and disenfranchisement of so many men makes families and communities struggle for unity and economic strength. Women often bare immense burdens of maintaining households and trying to raise and protect their children- to teach them pride, strength and hope in the midst of a threatening reality. Many young Palestinian males share rights of passage of harassment and captivity similarly to young men of color in other parts of the world, even here. The U.S. injustices rooted in displacing natives, relying on slavery for economic growth, and later administering discriminatory laws under Jim Crow have put the U.S. in a place where black men have been systemically criminalized and assumed guilty until proven innocence. How can these people be innocent and receive empathy in a country where they’ve been pegged as violent aggressors without historical context (that includes them being the recipients of violence for generations)? Palestinians are faced with this dilemma as well. Under an oppressive judicial, police or military system, these young males are presumed as a threat before they even act. Even youth are suspects; building the foundation for them to be devalued and mistreated. Legal systems set the tone for how citizens view youth and adults. In the U.S., we have the recent examples of Kimani Gray who was shot and killed by N.Y.P.D. officers and George Zimmerman’s murder of Trayvon Martin. Palestinian youth also receive brutality and harassment from Israeli soldiers and citizens. For example, last year Jamal Julani, a Palestinian teen was attacked by Israeli teens in Jerusalem until he was left unconscious. This year in Aida refugee camp, 13-year-old MohammedAl-Kurdi and 15-year-old Ahmed Amarin were fatally shot by Israeli soldiers in front of a community center. The power of social media led active community members to seek justice for Trayvon Martin. A change.org petition circulated and raised an overwhelming amount of support in favor of charging Zimmerman and finally the state responded. Even when justice wasn’t served, adults and youth continued fighting to illuminate the legacy of racism and racial profiling- to advocate for young black men and stand in unity. However much like Kimani Gray’s death, the deaths and imprisonment of many Palestinian youth go unreported and misunderstood in the U.S. media. We must challenge ourselves to learn the names and circumstances of those, local and internationally whose deaths and suffering never make headlines. Just as many American activists from groups like Decarcerate P.A. and the Youth Art & Self-Empowerment Project address issues of imprisonment and the charge of minors as adults, children as young as 12 are held in Israeli military detention without charge, for renewable, six-month periods. 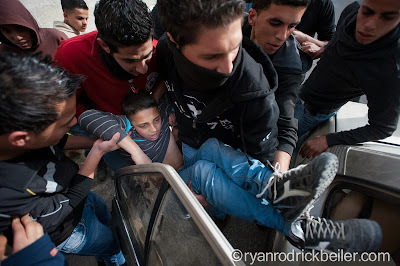 According to the UN, in 2011, 200 Palestinian youth were arrested per month. The double standard for how Palestinians are treated within the Israeli courts is just one facet of apartheid in Palestine-Israel, reminiscent of that in South Africa and Jim Crow south. Respected figures in the civil rights movement like Alice Walker have long admonished the occupation and chosen to stand with the Palestinian people. Walker wrote Alicia Keys a letter to join the cultural boycott of Israel a couple months ago but her letter wasn’t understood or received by the public or perhaps Keys herself. In addition, Nelson Mandela’s friend Ahmed Kathrada who also was imprisoned for fighting against apartheid wrote a letter to Morgan Freeman, asking him to pull out of a fundraiser for HebrewUniversity. Other public figures like Angela Davis and Lenny Kravitz have spoken out against the Israeli military occupation as well. These people recognize the importance of connecting local concerns and action to international solidarity and advocacy. The fight for Palestinians to be recognized and have freedom is an ongoing struggle. Peace negotiations will inevitably resume at some point, with the U.S. playing referee. As American citizens, we often hear in political discourse that Israel is our biggest ally in the Middle East, a beacon of light and example of democracy. However as we know, young democracies built on the displacement of others are imperfect and in need of constant examination and changes so that more people can thrive and live in peace. Many refugees and immigrants from Palestine, like other regions of the world are now American citizens, continuing life in a place with its own contradictions and injustices. Stories of pain and persecution are more often silenced than shared. Learning more about other countries, especially where the U.S. government has a large presence is a way to better understand our country, its people and influence. I encourage you to look into the rich history and culture of the Palestinian people, learn the names of politicians, artists, and even innocent boys whose lives have been cut short by unpunished crimes.